Screening at SIFF, the documentary tells the story of Chicago culinary master Curtis Duffy. The Seattle International Film Festival’s got almost a dozen food documentaries this year under its Culinary Cinema umbrella, all of which look worth any food nerd’s interest. Love Pulitzer-Prize-winning food critic Jonathan Gold? (Who doesn’t?) See “City of Gold” to learn more about the man (and Los Angeles food, of course). Curious about why acclaimed chef Sergio Herman closed down his Michelin-starred Netherlands restaurant Oud Sluis? (I am.) See “F**KING PERFECT.” Love sugar, sherry, saké and/or steak? (Um, yes.) SIFF has the documentary for you! And for those with the cash and the inclination, a half-dozen different Dinner & a Movie nights are also on offer. “Cooking Up a Tribute,” concerning Catalonian restaurant El Celler de Can Roca, followed by dinner at Jerry Traunfeld’s Poppy on June 2 ($125), looks like a standout. At first a crisp, professional and predictable-seeming chronicle of a highly driven chef opening a very high-end Chicago restaurant, “For Grace” has a truly horrific, real-life tragedy at its heart. (Don’t worry, no spoiler here.) The chef, Curtis Duffy, is good-looking, ambitious to the point of near humorlessness, a man who seems too calibrated to be truly interesting. 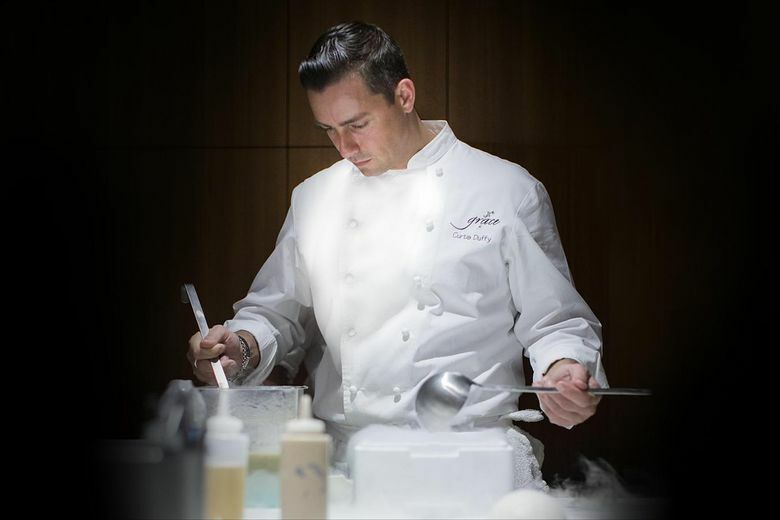 After training with Chicago’s best at Charlie Trotter’s and Alinea, he earned stellar reviews and two Michelin stars for his modernist cuisine at Avenues in the luxury Peninsula hotel. Now he’s ready to run his own place — he’ll call it Grace. He’s at the gym at 4 o’clock in the morning; he regrets a recent split with his wife and misses his young kids, but it seems like a sacrifice he’s willing to accept, and to accept responsibility for. Grace is his dream, he says more than once. All this seems stereotypical, and snippets of interviews with the great Grant Achatz and other Chicago chefs don’t hold many surprises. The film visits and revisits every aspect of the restaurant’s construction, from demolition onward, but details stand out: The seamlessness of the Grace experience demands tables with a base that your charmed feet will never be aware of, and it turns out that the precisely right chairs cost $1,000 each. A conflict with a former mentor, the renowned, late Charlie Trotter, provides brief sparks, but Duffy, while visibly stressed, adopts a philosophical attitude about delays upon delays — nine months’ worth, in the end. “For Grace” was originally intended to be a 15-minute web short. With the protracting timeline, though, Pang says, “After filming so many scenes of blueprints and concrete, we ran out of things to talk about with Curtis. So we — my co-director is Mark Helenowski — started asking about his personal life.” They had no idea of what they’d uncover, and the footage in the film is their moment of shock as well as the viewer’s. “I remember driving home with Mark and [we] sat in stunned silence,” Pang says. If the portrait of Duffy remains in some ways a surface-level one, you absolutely understand why. A man who realizes true happiness may be out of his reach, he only hopes to attain a state of relative grace. But add in the world’s most unassuming, sweetest hero — Duffy’s high-school home ec teacher — and a literal reaching-for-the-stars ending, and “For Grace” tells an incredible and incredibly moving tale. SIFF-goers will have plenty of questions for Pang.